Yann Martel's wonderful novel Life of Pi is first and foremost a gripping adventure, but it is also a unique meditation on nature, theology, and the decision about what to believe. The first part of the novel introduces us to the main character, Pi Patel, his early childhood, his family, his religious beliefs, and the fundamentals of zoology. Then the second, longer part tells the amazing story of his survival from the sinking of boat traveling from India to Canada, spending months on a lifeboat with a Bengal tiger. Pi is an unusual teenager, mainly because he insists on being Hindu, Christian, and Moslem. As he tells of his religious belief, he explains his devotion to each religion and his insistence that they are compatible with each other. He also explains that he respects atheism more than agnosticism, because an atheist at least makes a choice about what to believe, while an agnostic clings to doubt, which provides no guidance about what to do. Pi Patel retains his comprehensive belief in multiple religions into his adult life, as we see in the few chapters written from the perspective of a visitor to Patel's house much later when he has returned to India. These chapters by a different narrator help to reassure the reader that Pi's story has independent verification, and that the tale of his time on the high seas is not a pure figment of his imagination. If it were not for this, we might dismiss the story as merely an amusing fantasy, but the other point of view forces us to ask where the limits of truth within the fiction lie. In the second part of the novel, Pi's religious life plays little role, and the detailed description of his spiritual life in the first half might appear to be mere background information to deepen his character. In this second part, Pi is adrift with several zoo animals in a lifeboat after the ship he was traveling on with his family has suddenly sunk. The drama is purely about how he manages to survive through his ingenuity and his knowledge of the psychology of dangerous animals. Pi's amazing story is enthralling, and some readers may be impatient to get to this part of the novel. However, the link between the two parts of the book, which gives it depth and coherence, is precisely the epistemological question of what grounds our belief. When, at the end of the novel, the reader is given the some reason to directly doubt Pi's account of his time at sea, Pi's earlier comments about agnosticism come to mind. The possibility that Pi has fabricated his story about the Bengal tiger raises the fascinating question of whether the story has a symbolic meaning rather a literal truth. It's clear that some of the animals within his story could stand for other people, but especially thought provoking is what the floating paradise island populated by Mir cats might symbolize. 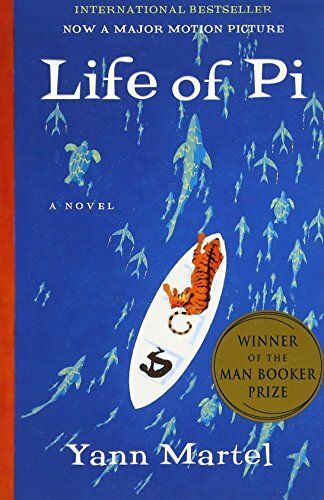 Life of Pi is one of the most imaginative novels written in recent years. Martel has a great facility with language, and the book is a real pleasure to read with its combination of humor and adventure. Jeff Woodman does an excellent job reading the unabridged audiobook.